14 or more points in the first quarter: Victory in the book? 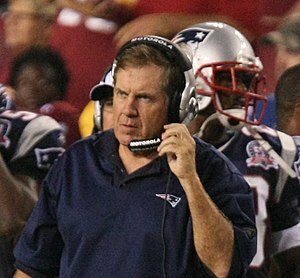 New England Patriots coach Bill Belichick had to be feeling pretty good. Logan Ryan had just intercepted a pass and returned it 79 yards for a touchdown putting the Pats ahead 14-7 in the first quarter of their game last Sunday against the Jets. Considering that in the past 22 games where the Patriots had scored 14 or more points in the first quarter they had eventually won 21 of those games, you would assume Belichick and his team were well on their way to their sixth victory against one loss for the season. Unfortunately, the end result was not a win. The Jets got back in the game, it went into overtime and the Patriots lost on a field goal. Scoring 14 or more points in the first quarter of an NFL game has for the most part been a good omen for teams. Since 2000, there have been 491 times when a team has scored 14-plus points in the first quarter. Those teams have won 400, lost 90 and there was one tie. That’s a winning percentage of .816. Do that in every game of a 16-game season and that will get you 13 or 14 wins, enough probably to host all of your playoff games. The Green Bay Packers have had the most games since 2000 where they scored 14 or more points in the first quarter with 27. The Baltimore Ravens are the only team since 2000 to not lose a game when they scored 14-plus in the first quarter. They are 9-0. Following is a look at each NFL team and how many games they played since 2000 where they scored 14 or more points in the first quarter. Their record in those games is also noted. Teams this year are 12-3 (.800 winning percentage) if they scored 14-plus points in the first quarter. Dallas, New England and Oakland are the three teams that have lost games this season after scoring 14 or more points in the first quarter.